Choose from 99 Free logo clip art selections for your Ideal 100 4913 Name Rubber Stamper. This is style 1152 or 1552. Each of the logos are perfected in Adobe Illustrator® to make really nice imprints on Self Ink Rubber Stampers. Click on the link. PIck a logo you like. Then type the number of the logo in the space provided. Name Art Address Stamps have many creative possibilities. 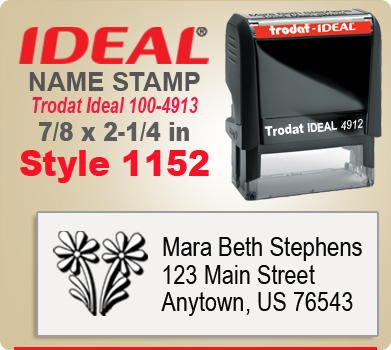 Trodat Ideal 100 4913 is a nice choice for a medium sized stamper. 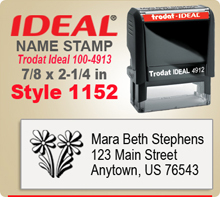 Your completed Rubber Stamp Name Stamp will look almost identical to the example shown. If order is entered by 4 PM Central time your Stamper will ship the following day.